One more source of audio files and subtitles to learn a foreign language are videos from YouTube. For example, CCProse channel has more then 100 classical books together with subtitles. 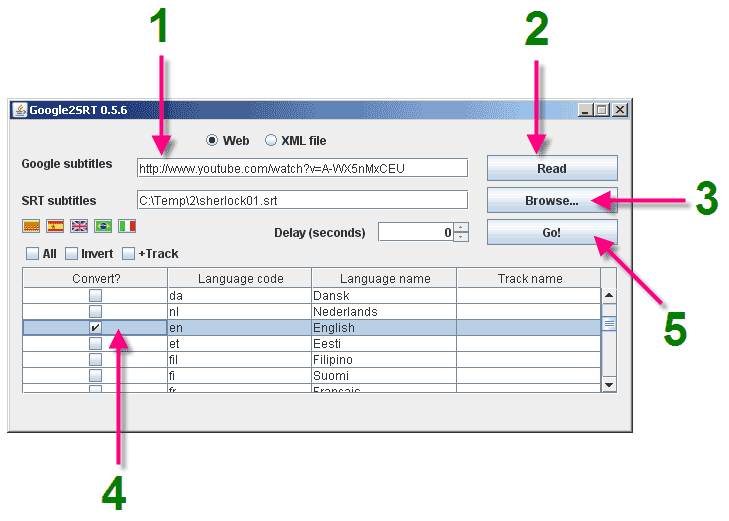 Let's take a look at how to extract audio and subtitles from YouTube videos. Search for "extract audio from youtube" in Google. Go, for example, to convert2mp3.net. Copy address of YouTube video into "Insert video link ..", press "convert", wait for completion of MP3 extraction and download the file. The search in Google for "extract subtitles from youtube" lead me here: google2srt.sourceforge.net. Download the application, unpack "zip" archive. Start "run.bat" (application requires Java, if you don't have it, go here). Please, check that both MP3 and SRT files are in the same folder and have the same names (except extensions) – this will allow WorkAudioBook to open subtitles automatically when you open MP3 file. Attention! Most of subtitles on YouTube have inaccurate timing of text. 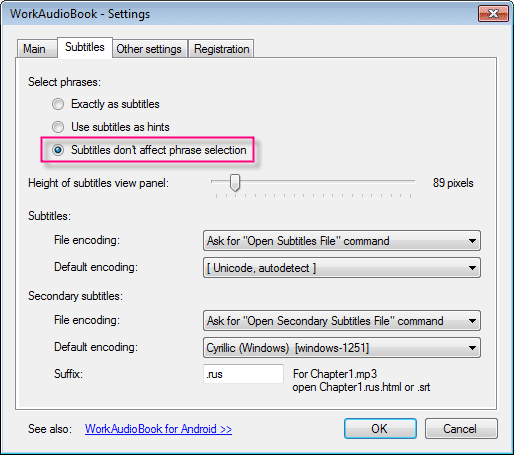 So, go to Settings in WorkAudioBook, and in "Subtitles" section for "Select phrases" setting select "Subtitles don't affect phrase selection" option.